Stem cell isolation is a critical step in cord blood banking. It affects the number of stem cells that can be harvested or recovered from the cord blood. Cell recovery rates are critical because a higher number of stem cells could enhance the success of the transplant or treatment. That's why Cordlife has invested in the Sepax®2 automated stem cell processing technology, a safe, sterile and fully automated cord blood processing technology - so you get more stem cells for maximum transplant success*. 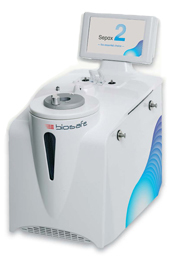 The first private cord blood bank in Singapore that offers the Sepax®2 automated processing technology, this Swiss-made and U.S. FDA-cleared device can recover as high as 99.88%1 of Total Nucleated Cells (TNC) from cord blood. It is also a functionally closed processing system which ensures the sterility of the cord blood by eliminating exposure to air contaminants. Find out the features of Sepax®2 and what it means to you, as a parent. Over 1 million cord blood units3 have been processsed by the Sepax® System in over 50 countries, this is almost half of the worldwide processsing procedures for cord blood inventory. Cordlife is the first private cord blood bank in Singapore to offer automated cord blood processing with Sepax®2. *Kindly note that the above mentioned is general information only. Please refer to the Cordlife Service Agreement for full details and its terms and conditions. Cordlife Group Limited reserves the rights to amend or cancel any of the benefits listed above without prior notice. International quality standards may differ between the time of enrolment and time of release of your baby's cord blood unit for transplant. All reasonable efforts will be made to adhere to the prevailing standards at the time of release of your baby's cord blood unit. HLA testing and CFU Assay may or may not cease to become a mandatory quality check.Cordlife has taken added insurance coverage, to safeguard you and your family from financial loss that results from direct malpractice*. Maximizing the recovery of Total Nucleated Cells (TNC) from your child's precious cord blood is one part of the equation. The next crucial step is ensuring that the cells are carefully prepared for cryopreservation so that they can be stored indefinitely while retaining its viability for treatment purposes. Cordlife is the first family cord blood bank in Singapore to adopt the Smart-Max™ technology - a fully automated cryoprotectant infuser, mixer and cooling device that allows for the consistent preparation of stem cells for cryopreservation. Unlike other devices that require manual handling, this Swiss-made device has high precision and is the epitome of reliability and quality. The razor sharp precision of Smart-Max™ injects cryoprotectant at a constant and pre-defined temperature without any deviation in protocol. This mixes the cryoprotectant homogeneously with the stem cells without the need for human interference, thus averting any chance of human error. This ensures that the quality of the stem cells is maintained as they are placed into the liquid nitrogen storage systems at below -150°C. With this implementation of Smart-Max™ , Cordlife's cord blood processing is now fully automated from receipt to storage, therefore ensuring that your child's cord blood is well protected.